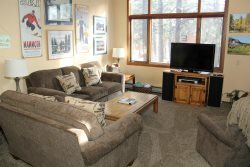 5/24: Mammoth Rental Snowcreek 628 - Living Room has a Woodstove without Firewood provided. Guest can purchase their own firewood. 2 Bedroom & Loft & 3 bath condominium in Phase 4 of the Snowcreek Development in the scenic meadow area and near the Snowcreek Golf Course and Shuttle stop for your Mammoth Lakes Vacation. Sleeps up to 6 people. Master bedroom has 1 King Bed, 2nd bedroom has 1 Queen Bed, loft has 2 Twin Beds and the living room does not have a sofa sleeper. Wifi is provided. 3 Flat Screen TVs (Living Room, Master Bedroom & Loft), 1 DVD, 2 VCR`s. Great view of the creek. Phone in unit 760-924-8805. Wifi Internet Access. Washer & Dryer in the condo. This unit does not have a BBQ on the deck. In addition the owner of this unit does not provide firewood for the fireplace. The rental guest will be responsible for providing their own firewood. There is not a swimming pool or jacuzzi at Snowcreek Condo Rentals Mammoth Lakes. You can pay separately to use the Snowcreek Athletic Club for those additional amenities. You walk up one flight of stairs to enter the unit and the unit is 2 levels. The first floor is the Living Room, Dining Room, Kitchen, Both Bedrooms and 2 Bathrooms, the second floor is the Loft and Third Bathroom. COMPLIMENTARY INTERNET AND CABLE TV are provided, however NO REFUNDS will be given for connectivity problems or Internet failure. TOT LICENSE 807-SC628.Great view of the creek. Phone in unit 760-924-8805. Wifi Internet Access. Washer & Dryer in the condo. This unit does not have a BBQ on the deck. In addition the owner of this unit does not provide firewood for the fireplace. The rental guest will be responsible for providing their own firewood. There is not a swimming pool or jacuzzi at Snowcreek Condo Rentals Mammoth Lakes. You can pay separately to use the Snowcreek Athletic Club for those additional amenities. You walk up one flight of stairs to enter the unit and the unit is 2 levels. The first floor in the Living Room, Dining Room, Kitchen, Both Bedrooms and 2 Bathrooms, the second floor is the Loft and Third Bathroom. COMPLIMENTARY INTERNET AND CABLE TV are provided, however NO REFUNDS will be given for connectivity problems or Internet failure. TOT LICENSE 807-SC628. We enjoyed our stay at Snow Creek Condo 628. It was nice and clean. Snow Creek location was beautiful. Thank you again for your kindness and help. Look forward to ski and fishing season again! Overall, we have had a lovely stay here and enjoyed the location of the rental. Its been a nice stay and the unit is very spacious. Thanks. Home was very cozy and host was very good with communication! The pictures dont do justice, the place is nicer than what the pictures look like on the internet.